Sift the flour and salt into a bowl and make a well in the centre. Lightly beat the egg and pour in. Mix the milk with 55ml water and slowly add to the egg, beating with a wooden spoon. Gradually incorporate the flour from the sides of the bowl. Beat until smooth. Stir in the oil and calvados, if using. Strain through a sieve into a jug. Ideally, this should be left to rest for 30 minutes, but it doesn't really matter if you don't do this. Heat a non-stick frying pan over a fairly high heat. Rub with a thick wad of oil-soaked kitchen paper. When the pan is hot and well-greased, remove from the heat, and holding it at a slight angle, pour in some batter. Quickly rotate the pan so that it is evenly coated. You just want a thin layer - any excess can be returned to the jug. As soon as the batter begins to set and form bubbles, loosen the edges with a palette knife and flip over. Cook for another minute, then slip the pancake on to a warm plate and cover with greaseproof paper. Grease the pan and repeat. 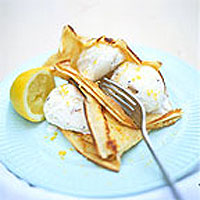 When the pancakes are cooked, serve with sugar and lemon juice.